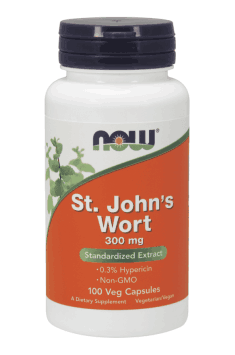 St. John's Wort is a complex product designed for people who want to safely and naturally improve their mental well-being and maintain the organism's balance. It is estimated that these days more and more people are suffering from negative emotions, low energy and motivation or the lack of satisfaction in life. Fortunately, there are natural mood stabilisers that help the organism to metabolise chemical substances responsible for good mental well-being. St John's wort – exhibits properties comparable with those of pharmacological antidepressants. Biologically active substances present in it, particularly hipericin, flavonoids and hyperforins, regulate the level of neurotransmitters in the areas of the brain responsible for depression's pathophysiology. St. John's extracts' antidepressant effects consist in inhibiting serotonin, dopamine and noradrenaline reuptake. As a result, the activity of the "happy hormone" (serotonin, responsible for a good mood) is increased. St. John's Wort is a high-quality product containing components crucial for good mental well-being. Their activity consists mostly in regulating neurotransmitters (especially dopamine and serotonin). Thereby, it solves the problem of the lack of chemical balance in the brain, which is the most frequent reason for a low mood. Contrary to synthetic pharmacological drugs, compounds contained in the supplement are safe for the organism and non-addictive. It is a perfect choice for people who need a boost of energy, motivation and positive thoughts. The product efficiently supports the nervous system, allows to naturally eliminate the symptoms of anxiety-depressive disorders, evokes relaxation, and promotes good sleep. St. John's Wort 300mg 100 caps. One capsule 3 times a day during meals. The recommended daily dose is 900 mg. Improves the nervous system and reduces the symptoms of mild to moderate depression. The first effects can be seen after 2 weeks. In the case of taking higher doses should not be exposed to sunlight, as this substance has photosensitizing properties.